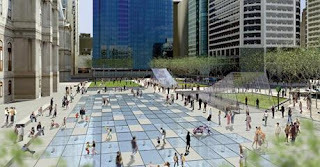 If you have ever seen the current Dilworth Plaza on the west side of Philadelphia’s City Hall, you will probably also rejoice to hear that a major redevelopment of this plaza is set to begin this year. As Wayne Engebretson puts it, “The current surrounding space was not built for community interaction, and much of the visual charm of the area is obscured by stairs, walls, barriers, and other poorly-placed features that were installed as part of the ’60s-era granite-paved design of the plaza.” Being entirely made of concrete, the plaza is not eco-friendly either, contrasting with the city’s overall progressive and green accomplishments such as their impressive number of green roof installations and ambitious ‘all-green’ stormwater management plan. Thankfully, the new plans call for a 38% reduction in the impervious area and planting of 76 new trees while still being able to accommodate 8,000 people in this outdoor space. All things considered, the project is projected to reduce the ambient temperature by 2 degrees Fahrenheit by increasing the tree canopy and decreasing the impervious area. 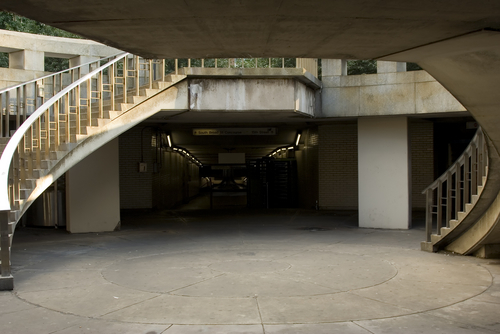 Today: the majority of the plaza is sunken below street grade and non-handicapped accessible. The sunken parts of the plaza are less welcoming to the general public and create a disconnect between the plaza and the adjacent historic City Hall building. Personally, I think it is important to create green urban spaces where the public can interact, with nature and with each other. A great way to begin to break down the barrier between the natural environment and built environment in highly urbanized areas is to incorporate creative stormwater infrastructure into new urban spaces. This project will be a particularly important example of our ability to retrofit existing urban spaces to be more welcoming and green, not to mention the fact that this project will create 1,060 jobs.